Photo of Lindsay Archer taken in 2009. The youngest of two children, Lindsay was born in North Carolina, moved to Indiana at the age of three, but has spent the majority of her life in Georgia after the age of six. Her artistic skill comes mostly from her maternal side, fostered by her mother, who had little confidence in her own ability, yet maintained an understanding of the frailty of a sensitive and creative spirit. Lindsay’s mother used this insight to encourage her daughter’s artistic ability. Lindsay’s grandfather, an accomplished artist himself, deemed the family’s creative tendencies “the family curse”, reaching back through generations. This curse has touched each of his children and grandchildren in one way or another whether it be through writing, painting, sculpting, photography, acting, or film. Lindsay was already pursuing her artwork when the connection to Howard Pyle was discovered in her genealogy. The family resemblance of such similar interests and artistic content was enough to raise an eyebrow or two. Lindsay riding her horse in the late 90s. This image was used for the painting “Journey’s End”, considered her break through piece. Another shared family interest is a love of horses, which was Lindsay’s most beloved subject for her artwork. At a young age, Lindsay had asked her parents for a horse, to which she was told that she could have one if she could afford to buy one. Taking her parents at their word, Lindsay saved her allowance and worked on various endeavors to make money. Even in grade school, Lindsay mixed her artwork with an entrepreneurial spirit by using her father’s photocopier to make copies of her artwork and sell them for 10 – 25 cents a piece. Her photocopied art helped pay for ice cream and slushies, allowing her to save some for her horse. 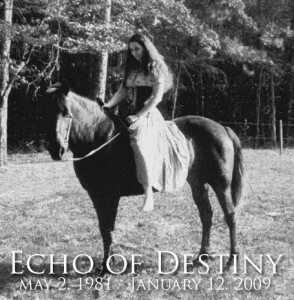 At the age of fifteen she had saved enough to purchase a black Tennessee Walking Horse that she named Destiny. Watercolor painted by Vernon L. Drake, Lindsay’s grandfather. Lindsay’s grandfather inspired her love of horses, largely because he owned a ranch in Montana, where Lindsay spent her summers until after high school. There Lindsay and her grandfather went horseback riding and painted together, giving Lindsay her first lessons in watercolors and inspiration for her work. Although her grandfather was her primary influence, Lindsay was also influenced by her grandmother, who would sculpt figurines out of sculpey with her. Each summer Lindsay’s talent got an extra push in development by being in a creative environment, which became a powerful influence on her life decision to become an artist. Her grandfather occasionally voiced regret for not pursuing his own art until after retirement when his eyes were weaker. Not wanting to live with the same regret of never knowing what might have been, Lindsay took the leap to professional artist. The love and admiration Lindsay held for her grandparents and the land itself from which her family came, can be seen in her artwork. 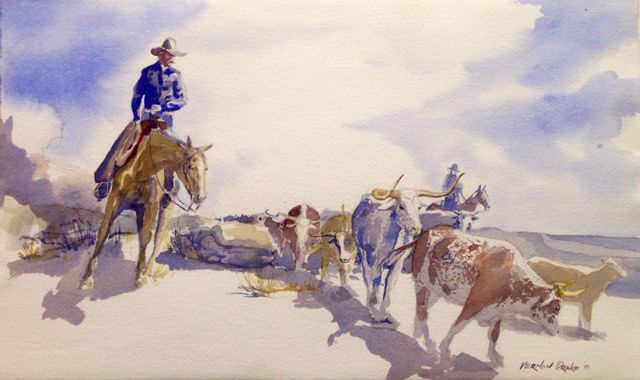 Both grandfather and granddaughter painted similar imagery early on, choosing to paint horses, cowboys, Native Americans, and other Western themes. But while that was the majority of her grandfather’s work, Lindsay’s love of horses expanded out to unicorns, winged horses, and knights on horseback. Movies such as the Dark Crystal and The Last Unicorn fueled her sense for imagery that was beyond what could be photographed. Photo of Lindsay painting a mural. During high school, Lindsay painted murals in various places, including classrooms at her school. Because of her love for the West and a friend named Amy who was in touch with her native heritage, Lindsay was introduced to Pow Wows. After befriending the Irwin family who traveled to Pow Wows selling jewelry, Lindsay began to paint Native American themes more frequently but this time for profit. When it came time to raise money for her French class’ trip to France, Lindsay desiring to immerse herself in the Louvre, worked Pow Wows painting everything from cow skulls to feathers to ostrich eggs, in order to raise enough money to go, which she did. After graduating from high school, Lindsay received her first formal art lessons at Wesleyan College where she spent two years. At Wesleyan she became friends with a girl named Robin, who introduced Lindsay to ElfQuest and fully immersed her in the world of fantasy and comics. Lindsay’s interests grew rapidly in college and began to reflect in her artwork. Robin and her roommate Carrie asked Lindsay to draw their ElfQuest character portraits and write stories together in the ElfQuest world, igniting Lindsay’s creativity and love for elves. As the writing group expanded, so did Lindsay’s interests and activities. She had begun taking Tae Kwon Do and fencing, which she adored and was not able to do when she was younger, because “she was a girl” and it was considered unladylike. Tomboy Lindsay however took her graduation money from highschool and pursued martial arts on her own. After two years at Wesleyan, Lindsay transferred to The Art Institute of Atlanta to study 3D animation, but continued to stay in contact and involved with fencing. 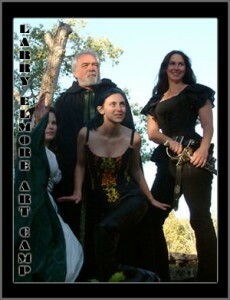 Through the fencing group, Lindsay had met Howard Scott, who was writing a Role Playing Game called Legendmaker. He needed artwork and recruited Lindsay to illustrate the interior of the book. In 1998 Legendmaker debuted at Dragon Con and Lindsay joined Howard and his co-conspirators in promoting the book. Soon Lindsay found the niche that her art had been leaning toward all that time and discovered that she was not alone. It was at that first Dragon Con that Lindsay met Nene Thomas, who encouraged Lindsay’s artwork and years later donated one of her panels to Lindsay for her first showing at the Dragon Con Art Show. Although Lindsay had illustrated for Howard, she still was working toward her degree in Computer Animation. Seeing promise in her, one of Lindsay’s animation professors helped her to attain animation work for Click 3xs and Primal Screen where she interned and later Free-Lanced on projects for Cartoon Network, some of which can still be seen today. Ominous photo of Lindsay taken on her wedding day. In 1999 Lindsay graduated with honors from The Art Institute of Atlanta and returned to her hometown in search of work, where she worked for an advertising company known as Third Wave Digital until she took a teaching position at Macon Technical College where she taught art and originated their 3D program. 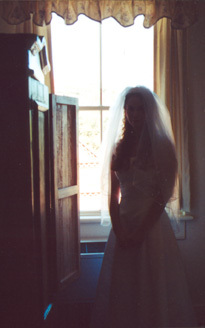 Although Lindsay was very happy teaching at Macon Tech, she had fallen in love with a man who moved her away to Greenville, SC with him to be married. On November 11, 2000 Lindsay married William (Liam) Thomas DeLoach and became his fourth wife. Promptly after being married, Lindsay quickly discovered why his previous wives had fled so quickly after wedlock. On October 8, 2001 Lindsay filed for divorce. Two days later Liam attacked her while she was painting, kidnapped, and violated her repeatedly with intent to murder, a crime that sent him to prison until October 23, 2013 (life sentence is 12 years). Even though her ex husband had tried to destroy her, Lindsay continued all the more avidly to pursue her artwork. When things got rough and she thought that she could not carry on, her stack of unfinished paintings continued to call to her to be finished, spurring her onward despite the flashbacks while painting. Still bearing the last name of her attacker, Lindsay decided to choose a new last name for herself instead of returning to her maiden name. It was a statement that she no longer wanted her identity to be defined by the men in her life, but by who she wanted to be. As Lindsay identified with the Archer, her characters in her writing often being archers, she legally filed it for her last name and did not change it when she remarried in 2005 to Trenton Adams, a Georgia Tech graduate working as a software engineer in Atlanta. Lindsay brought many costumes and props to the first camp when Larry mentioned possibly wanting to paint her, then clad the class in costume for a reference shoot. After observing successful artists, Lindsay took the leap to professional full time artist in the fall of 2003 with the help of her beloved friend, Stephen, and started the Prints and the Pauper, LLC. Traveling to conventions around the country selling and promoting her artwork along with the work of other artists, Lindsay emerged on the fantasy/scifi scene. Although there were and are many obstacles, Lindsay was fortunate enough to have the help of friends and peers in the field such as Mike and Paul Bielaczyc of Aradani Studios and the lovely people of Lady Panisda’s. In 2004 Lindsay was one of Larry Elmore’s first art students, and with what she learned at the camp, it took her artwork to the next level. After a couple failed attempts at finding a suitable business partner to help with the operations in order to allow Lindsay time to create, Richard Wilhite joined the Prints and the Pauper team adding support, charisma, and framing to the Prints and the Pauper services. It was Richard’s efforts that initiated Lindsay’s first illustration work for the Serenity RPG published by Margaret Weis Productions/Sovereign Press. 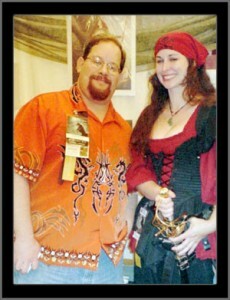 Richard Wilhite and Lindsay in The Prints and the Pauper booth at Dragon Con. In 2005 Richard and Lindsay opened a store together, in hopes that custom framing might help float the business. Because of location, sales ultimately did not support the store and it closed less than a year from the time it opened. After the closing of the store, came the closing down of the company, The Prints and the Pauper, followed by the sudden and unexpected death of Richard in April 2007. After a semi-sabbatical and consideration of quitting altogether, Lindsay knew that Richard had worked hard to see her artwork thrive and quitting was not an option. A new company arose from the ashes, Archer Productions. Under Archer Productions, Lindsay was able to participate in more exciting illustration projects such as the Supernatural RPG, Metamorphosis Alpha RPG, and Battlestar Galactica RPG. Branching out, she has also started illustrating card art, such as the card game, Pantheon, which inspired the creation of some of her most popular artwork, and the cover of the game itself. Being friends with game designers, such as Jamie Chambers, Lindsay also started contributing to some of Signal Fire Studios’ game design as well as T-shirts for Shirt Happens. In 2009, Lindsay gave birth to her greatest creation, her daughter Morgan Adams, who has increasingly inspired her to do some projects that are more fun or geared toward children. Life continues to present more challenges and opportunities to work on exciting new material for Lindsay. Recently Lindsay has taken the leap to tattooing, an art form that is in great demand. She also is working on scripts and novels. Her first published writing credit came from a tutorial book by Walter Foster Publishing, where she was a contributor for teaching to draw color pencil fairies. Lindsay has always got multiple projects to juggle and has been known to say “I’d say I have too many irons in the fire, but that just makes me want to take up blacksmithing.” She continues to create in any and every way possible. 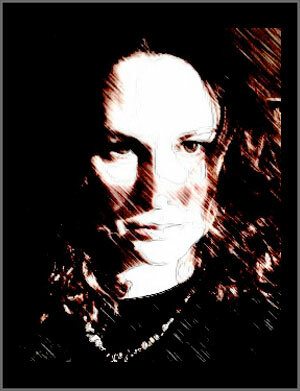 Keep up to date with Lindsay’s artwork through her own Facebook Page. Check out Lindsay’s blog on Blogspot.